All across America, whether it’s new Orange County, CA start-ups and established companies over the past two years plus have added thousands of new employees to their workforces. 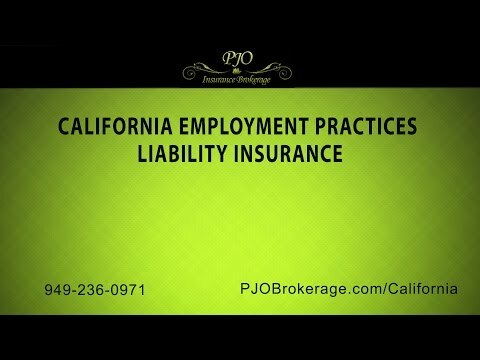 With this huge increase in employment, companies can always count on one thing, a corresponding increase in employment related claims or lawsuits, which explains why companies should make California Employment Practices Liability Insurance coverage an important part of their overall insurance program. One of the huddles we face when we sit down with either clients or potential clients concerning Employment Practices Liability Insurance coverage is their difficulty seeing any true value concerning this type of insurance can add to their overall insurance plans. California Companies many times look at this additional insurance coverage as another expense to avoid and not really seeing it as a smart way to protect their company’s assets. Nothing could be further from the truth, considering that employment-related claims are rising at very high rate and the average pay-out is approaching six figures. With the business environment as litigious as it is these days, acquiring an Employment Practices Liability Insurance Policy or EPLI for short, which is professional liability insurance that covers certain employment related claims made by a company’s employees is in our opinion a very valuable tool considering that employees will be interacting not only with each other, but with the general public and also EPLI can provide coverage from potential merit-less claims brought by disgruntled present and former employees. In almost all companies, the policy is to be as non-discriminatory and fair with employees as possible, but with age and gender gaps, sometimes those bad habits come back, which leads to some serious miscommunications with employees and having an EPLI Policy can serve as a first and last line of defense against an employee claim. In discussions with clients about Employment Practices Liability Insurance Coverage on why it is so important, here are two examples of incidents that happen quite often, one of your managers harasses or discriminates against an employee for what could be a multitude of reasons, this one is the most common, secondly, if you have employees that work in the field and they harasses a client, either by making an off-color remark concerning the client or in your worst nightmare case, sexually harassed one of your clients. Over the past two years, the number of lawsuits filed by employees against their employers has been rising by double digits and according to the experts, they don’t see this trend reversing anytime soon, so companies need to protect themselves with the proper insurance coverage. In discussing what the potential premium will be for Employment Practices Liability Insurance Coverage, there is no set answer. The premium charged will be determined on what particular sector your company is in, how many employees your company has, also, several other risk factors will also be considered, along with any losses suffered due to employment practices in the past. If your company has had no previous losses, it will be a major factor in keeping the insurance premium down. Generally, Employment Practices Liability Insurance policies will reimburse your business for any settlements and/or judgments and the costs of defending a lawsuit in court, depending on state law. An EPLI policy can cover legal costs regardless of whether your company wins or loses a lawsuit that filed against it by an employee. Please be aware that EPLI policies generally do not pay for punitive damages (unless allowable by law) or criminal or civil or fines. Other liabilities covered by additional insurance policies, such as workers compensation, are excluded from EPLI policies. For any companies that have employees, Employment Practices Liability Insurance Coverage in our opinion should be a part of the company’s overall insurance program. At PJO Insurance Brokerage, our professional brokers have access to various Employment Practices Liability Insurance carriers who will have the proper coverage policies for your company’s employment situation. Please contact us, we look forward to working with your company in the near future.